Four canners working in two teams did a production canning session in Facility Kitchens. Laurie Brooks was “Leader of the Pack”. They worked with strawberries. One team made freezer jam and the other made canned jam. Input: 8 flats of strawberries, 4 were hulled before coming in. Output: 32 pints of freezer jam, 29 pints of canned jam, and at least 16 bags of frozen strawberries. There were 2 failures to seal. Total Units: At least 77 total units of strawberries processed in one evening! Doesn't this look fun, nutritious and delicious!!! Kick off the Canning Season with the Canning Diva! 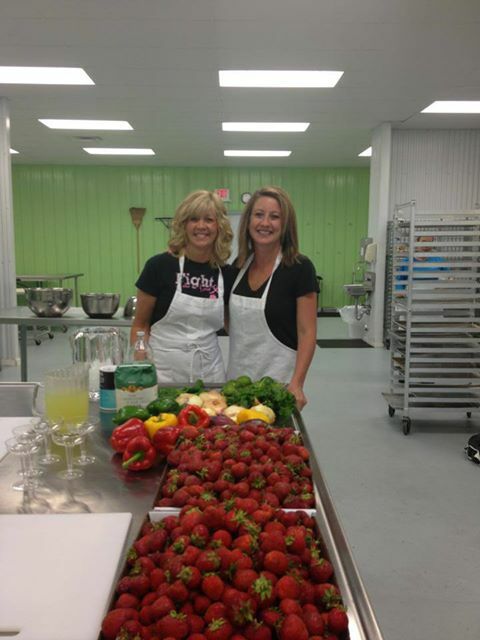 The Canning Diva and Facility Kitchens (a 2800 sq. ft. a commercial rental kitchen in Lowell, East on M-21-Fulton St) are teaming up to give West Michigan Canners an opportunity to can together! Canners will reap the benefits of a spacious commercial kitchen all the while having fun learning a new recipe their families will surely enjoy! What to Expect: Canners will be given time and resources to crank out a years supply of the Diva’s Signature Strawberry Salsa for their personal consumption! 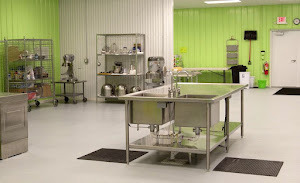 Canners will need to bring their own ingredients and jars/rings/lids – however, Facility Kitchens will provide food prep and processing supplies, facility space and utilities and, not to mention, the Canning Diva will be onsite to share her knowledge while keeping production moving forward! You must sign up before the class date as registration closes at 12:01 AM the day of the class. Payment is required at time of registration. Sometimes, we may have to cancel scheduled classes due to: insufficient participation, really bad weather, or other unspecified circumstances. In these cases we will notify you by email and phone and we will refund your payment. You may cancel your registration up to 1 week prior for an equal value class credit. No cash refunds for canning classes unless canceled by Canning Diva. Cancellations within 1 week are not refundable, although you may have someone take your class reservation. We cannot accommodate walk-ins, audits, or unpaid guests. Production Canning is designed for adults, however minor children over the age of 16 are allowed with an accompanying paid parent or guardian. We endeavor to make the Production Canning small, informal, entertaining, informative and fun. Feel free to ask any questions or share your experiences during the class. Each attendee is encouraged to bring enough ingredients and materials to produce as many jars of food for personal consumption as possible within the time allowed. We have non-alcoholic beverages available. You are welcome to bring a beverage of your choice – we have wine glasses. Aprons will be provided for your use during production. Production Canning start promptly at the scheduled time – so plan to arrive with enough time to settle in. 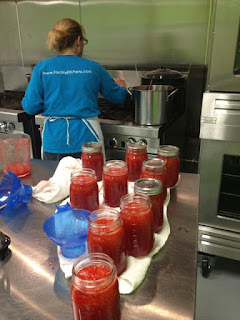 Thursday evening we canned “Signature Strawberry Salsa” and rhubarb-strawberry pie- filling. The hard part was prepping the strawberries, rhubarb, onions and peppers. It took almost 3 hours to wash and chop everything for a quadruple batch of each recipe. Fortunately it is enjoyable prepping and talking while drinking margaritas. The easy part was cooking the pie filling mixture and salsa mixture on the range tops for about 15 minutes. The really fun part was filing the jars. It takes some time and is my personal high-pressure part of canning. Both recipes only need to be water-bathed for a short time, and we were done! Total: 43 units and they are lovely on the shelf, all pink. What did we learn? Three flats of strawberries is a lot of strawberries and having Diane Devereaux running the session cuts ingredient waste and reduces failures. Thanks again Diane! Next week we will again can “Signature Strawberry Salsa” and a canned strawberry – lemon drink concentrate. 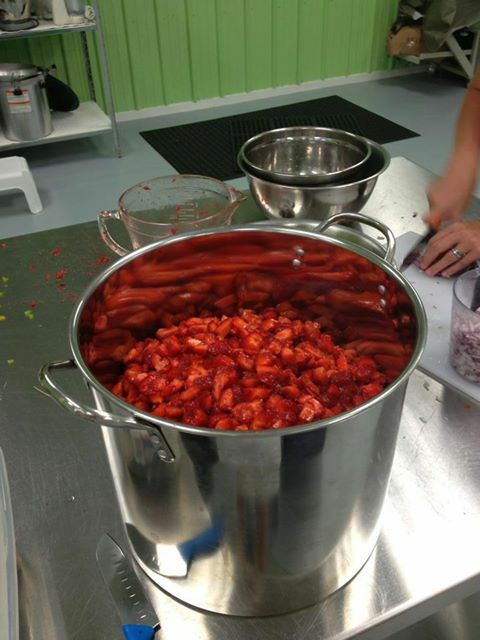 We planned to can rhubarb & strawberry pie filling in tomorrow’s production canning session. Rhubarb is ready and will still be ready next week. Strawberries are not ready and will be available next week. We will do rhubarb & strawberry pie filling along with “Signature Strawberry Salsa” in next week’s production canning session on June 13, 2013, starting at 5:45pm going until 10:15pm. To reserve your space in the canning line, go to www.canningdiva.com. My goal is to make three batches (21-24 pints) of rhubarb & strawberry pie filling and one batch (7-9 pints) of the “Signature Strawberry Salsa” in 4.5 hours next week. 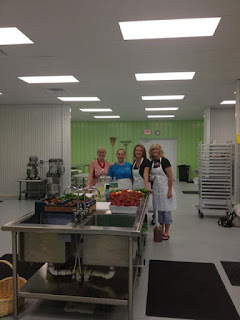 We started at 5:45pm with three canners, Janet and Clare of Facility Kitchens, and Diane Devereaux, The Canning Diva, who also ran the session. Janet & Clare brought in 20 pounds of fresh asparagus with the goal of processing it all into canned, pickled, and frozen asparagus. Diane brought in ingredients to test the creation of her new recipe of conserve. Michigan asparagus is in the peak of its season and our produce was tender and tasty which was perfect for processing. To prepare the asparagus, we washed and trimmed off the tough ends, then cut the spears to fit in pint jars, saving the cut off parts for freezing. The hardest part of this whole process was getting the spears into the jars. The spears to be pickled were hot packed with vinegar and salt and water bathed. The spears to be canned were packed with just water and pressure canned. A few spears and the reserved ends were blanched, vacuum packed and then frozen. Tally! 9 pints of canned asparagus in water, 9 pints of pickled asparagus in vinegar and salt and 5 bags of frozen asparagus for soup. We easily accomplished our goal in the 4.5 hours. Diane focused on perfecting her new conserve recipe; check out her facebook page at www.canningdiva.com for pictures and details. Tally! for Diane, 9 pints of very colorful conserve. Clare Seesing is in from Kansas City and is learning and helping to preserve the summer's harvest. Next week we are producing rhubarb & strawberry pie filling. Stay tuned!